We often get asked how to make the most of a properties extra spaces. Those extra rooms that are collecting unused Christmas presents or 'unused' Gym equipment. Our answer is to always indulge that side of you that for so long you have squashed with 'thats too flashy for me'. Nonsense - Interior Designer, David Long to the rescue with some marvellous tips on how to create the Luxury Walk in Wardrobe of your dreams. Walk in Wardrobes are a fantastic way to create the extra space you have needed for years. 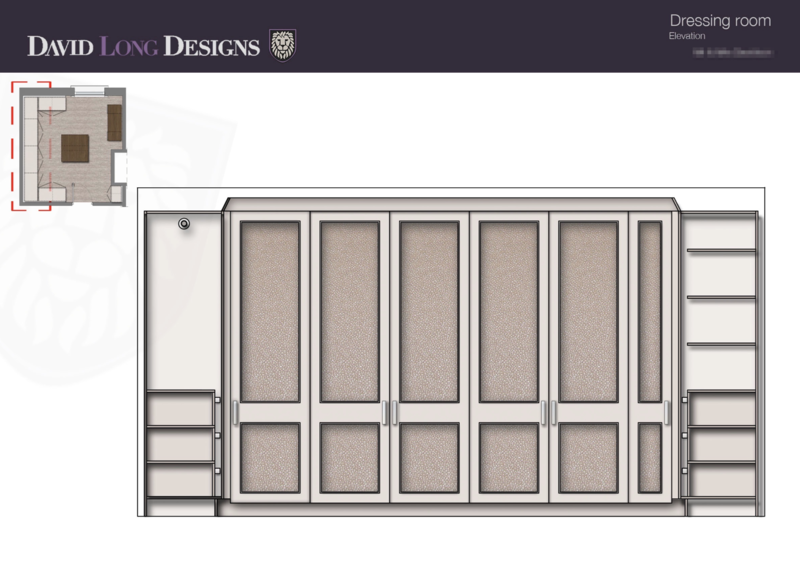 Here at David Long Designs we insist on knowing exactly what you will be putting into the wardrobes to make them completely user friendly. 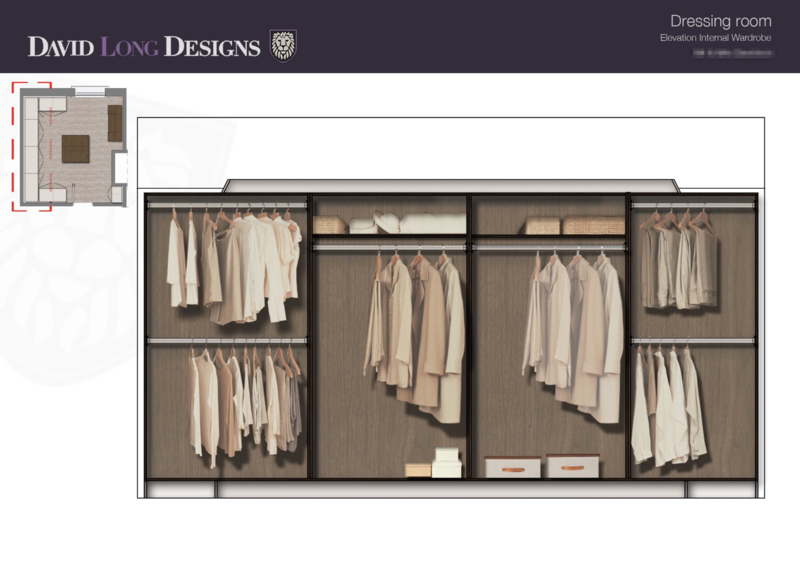 Our bespoke Walk in wardrobe design service will pamper to your every need. Our most popular - but not limited too - wardrobe door style is our classic shaker style. We give these doors a bit of a twist by incorporating beautiful textured panels and antique mirror to make them a statement piece. You can choose whether you want the doors hand painted or spray painted. Here at David Long Designs we feel that the hand painting makes them traditional doors whilst the spray painting keeps the wardrobe doors contemporary. So, you have committed to your project. Nothing is going to stop you having your new wardrobe. Clearly your clothes deserve a special place to live. But what now? This is where we as your very own wardrobe designer begins to guide you through your project. From pull down rails, watch compartments, safes and scarves hanging to hat spaces, secret compartments, luggage stores and shoe compartments. 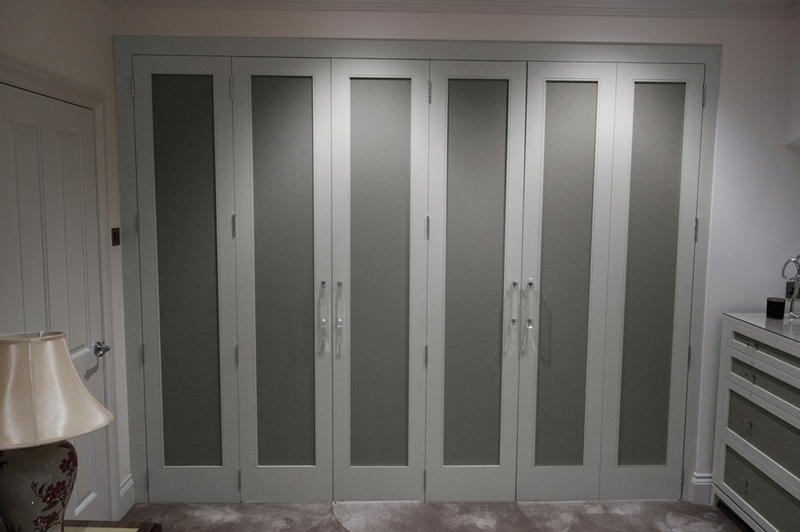 We can design the wardrobe to meet your needs and space. What is an even better way to make your wardrobes that bit more special. How about a secret door. 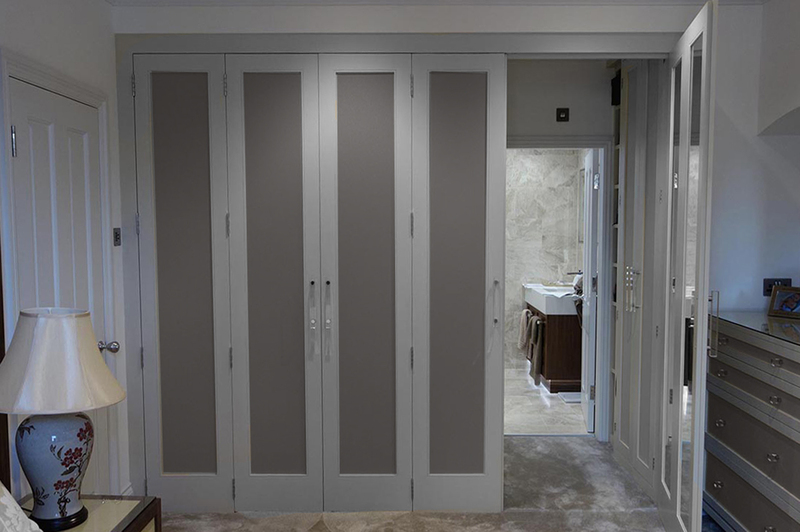 We have designed many secret wardrobe spaces that include further storage space and complete bathroom suites. By incorporating the 'Secret door' into the overall Wardrobe design it can be seamlessly concealed and disguised. All the wardrobe fittings for example the handles and hinges then match the main fitted wardrobe. You can then choose what to hide away. Whether you have a Powder Room, a Dressing Room or a Complete Bathroom Suite - the options are endless! 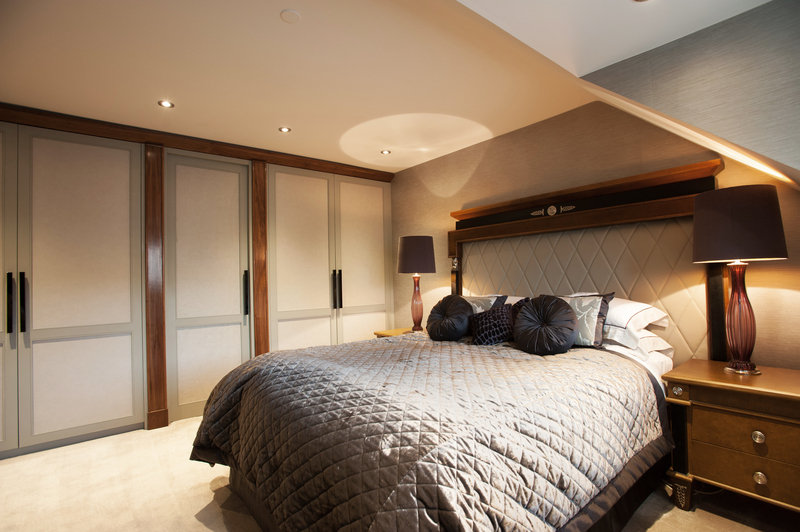 We loved designing this contemporary fitted walk in wardrobe. 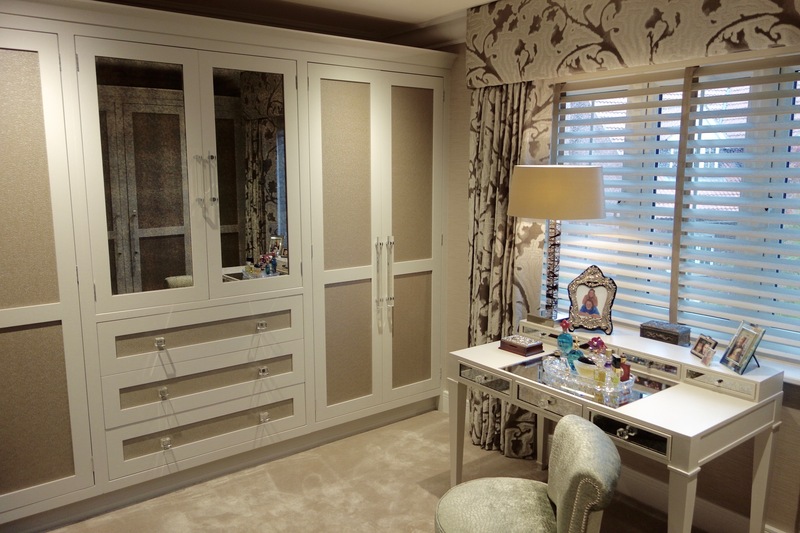 The client was blessed with the space of approx 21 square meters to work with for a bespoke wardrobe. Their brief was to combine a his and her fitted wardrobe with a coffee making station. The clients loved contemporary furniture and wanted a truly unique space to store their clothes. We designed all the storage around the perimeter to optimise the storage capacity as well as make the over all width feel bigger. The space was originally from 3 different rooms which were all on different levels. This was no problem as it added a stepped detail which was lit from below. All the doors and draw fronts were clad in diamond embossed leather with leather strapping on every upright and horizontal edge. The Tea and Coffee making area had a small built in fridge incorporated into the base unit as well as a cutlery draw and sink. The marble top was an ease for the client to wipe down and the mirrored splash back made the space feel much bigger. Copyright © 2016 davidlongdesigns.co.uk. All right reserved.